Argun wrote: Suggestion for next year regarding turns/setup: Why not have both teams have the same 45 minute setup, with the stipulation that once a unit is placed, you cannot move it again until first turn? Regarding the venue, I think a repeat of the hotel would work fine, as an example. Also, air conditioned. Having been to every event, I cannot stress how wonderful having it fully air conditioned is. The first two years, we were not so lucky, and frankly, it got ripe. Aegis wrote: Regarding the venue, I think a repeat of the hotel would work fine, as an example. Also, air conditioned. Having been to every event, I cannot stress how wonderful having it fully air conditioned is. The first two years, we were not so lucky, and frankly, it got ripe. Agreed.. A/C is definitely a desired element. Plus to grow the event I think the amenities of a hotel are desirable. People from out of town can stay, eat, play etc. all on site. Considering all the space we had on the right (near the two Emperor titans), I wouldn't doubt there could be enough room to house more tables for the points we'd be looking at. nope gotta bid for time! that is a big part of these apocalypse games! I'd also suggest limiting any turbo lasers to 1 for anything less than a warlord, if you follow the fluff or read any of the novels, the only "all turbo laser" titan I've come across is a warlord specially fitted for anti-titan duties. Everything else has multiple types for the varied targets. WYSIWYG is definitely a must, I got hit with double x2 turbo lasers from a model holding a sword and a gatler. I'm all for artistic creations, but if I look at something holding a sword (CC weapon) it better not be shooting D weapons. An updated table layout (Thank you Kern!) The deployment zones are a bit wonkey and should be 12" in on the vertical tables, and deployment can be adjusted to the full 48" if needed to support more models and/or fortifications. I think one thing we can all agree upon is next year we will need more table space - the question is how to get it in there and how to integrate it so I'm not just playing the guy across from me and asking for templates from my "allies" to the right and left. If we are to meet the pts>10^6 goal (points greater than 1,000,000) there will be many more large vehicles. As it is anyone who was near the 20k point mark or above had two table fronts (or needed them, xtrooper9) for 8' x 30" of deployment space (20sqft). With the row of I's here there are 12' x 3' + 4' x 2' (going out onto the bridge table) for a whopping 44sqft per "I". So jj3, if you play with your son that's half an "I", myself, Randolph, and a few others already make these 2 player by 2 player... maybe squeeze in a 3rd. With everyone returning home to the plastic dudesman arms race... see where I am going. I did feel bad for you running back and forth between tables, next year it might be a good idea to have anyone who covers two tables to be faced off against another person in the same situation, at least as much as possible. Talking with some of the other large force bringers Saturday night, I think they way I am going to attempt to address it is build a team. It will take a lot of prior coordination with Matt/Dave, but "TEAM TICKETS" would be awesome... Especially with the I-shaped table idea. Of course to keep the ratio of people to table space correct a minimum of 3000 points per person. I'm just thinking about my brother or a couple of my other friends who enjoy coming over to play, but don't collect. They'd never buy a ticket or come on their own, but if a TEAM TICKET ensured we got to hang out while playing, and maybe offered a slight discount - that'd be cool. jae4x4 wrote: nope gotta bid for time! that is a big part of these apocalypse games! Also I really like all the suggestions mentioned above. kernbanks wrote: As it is anyone who was near the 20k point mark or above had two table fronts (or needed them, xtrooper9) for 8' x 30" of deployment space (20sqft). With the row of I's here there are 12' x 3' + 4' x 2' (going out onto the bridge table) for a whopping 44sqft per "I". So jj3, if you play with your son that's half an "I", myself, Randolph, and a few others already make these 2 player by 2 player... maybe squeeze in a 3rd. With everyone returning home to the plastic dudesman arms race... see where I am going. Same basic amount of space for setup, still generally easy to get templates around, but a lot more room to grow. Downside is it would definately be more group battles than a grand battle. This is out in the world to get good discussion, enhance, and improve the design. 1) It favors shooting. Any CC army such as nids or orcs will be funneled into this one 48 inch longboard section while getting two spread out tables worth of templates laying waste to his army. The last thing any orcs, nid, ba or melee oriented army wants in Apoc is to funnel his units and have them march up 48+ inches vs a gun line two tables wide..
2) Multi table battles. Sometimes things are going very well or very poorly requiring assistance to or from an adjacent table (This actually being one of the awesome parts of Apocalypticon, forcing you to communicate and work with your teammates). 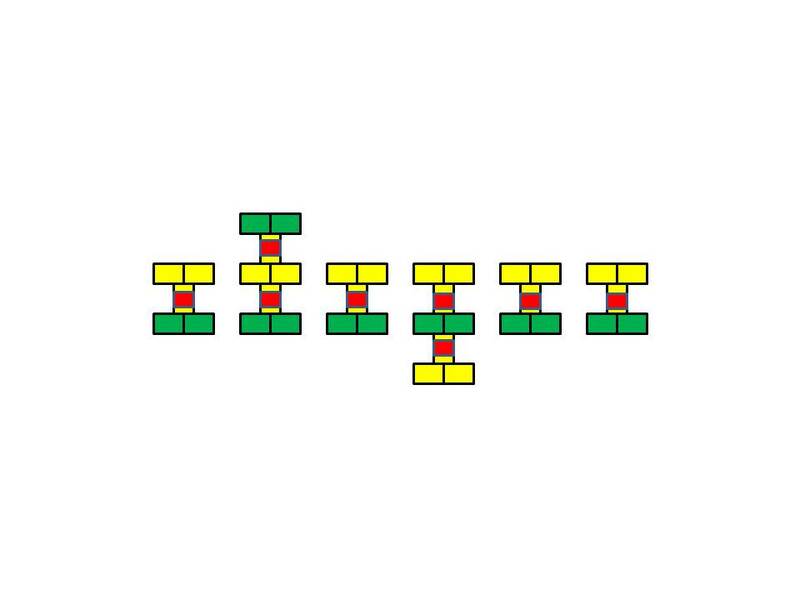 Having that "I" shape greatly reduces any lateral table movement, turning the battle into individual skirmishes as opposed to one giant battle / front. If anything I would suggest making it a double "I", adding another table in the middle to allow for more room and flexibility while crossing the battlefield. 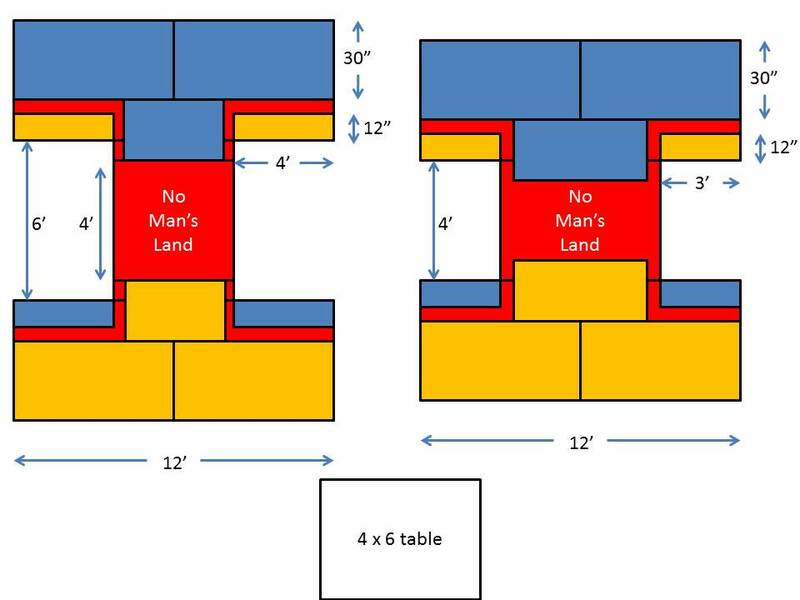 Having said that, it still does not address the 2nd point about the battles becoming more isolated (maybe add a specific 12 inch section in the middle of the table which leads to adjacent tables, this makes holding the middle that much more important). It is a hard topic regarding shooting vs assault armies and having the terrain favor one over the other. When sitting around eating that discussion happened, and that's why the 'forward' deployment was included as well. ie, the leading edge of opposite end of the "I" is also your deployment zone. As can be seen in both of these which were discussed. 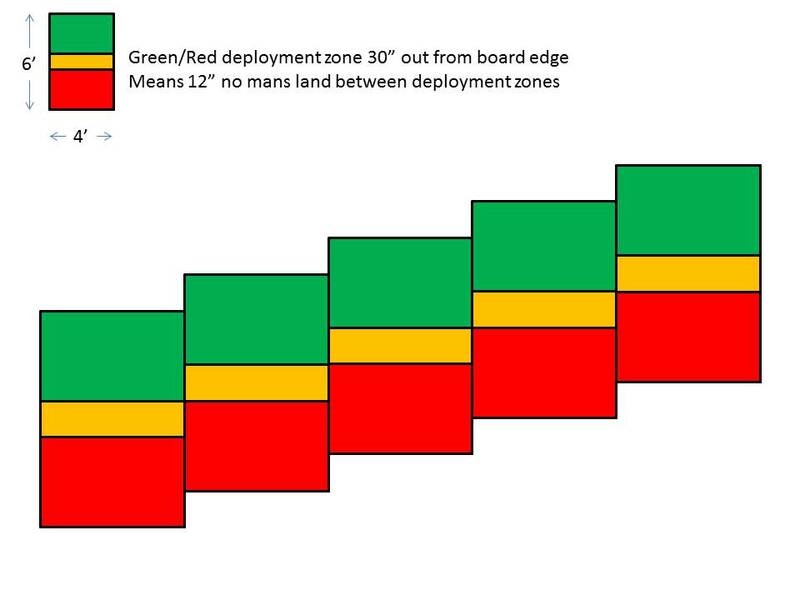 Here you can see there is a lot of deployment zone for each side and in fact assault armies can get stuck in quite fast if deploying within 6-12 inches of the enemy. It weakens some shooting aspects of those very shooty Armies by putting an extra 48-60" between the majority of the forces (Meaning lascannons etc are not ranging the entire enemy army). Super heavy long range stuff lobs across, and assault is mashed in the middle and against the front edge. square footage wise one 'I' is the same deployment space as 3.5 tables as set up this past year... so you'll still have 3v3 or 4v4... and depending if we want to crawl under tables to get inside the centers these could be placed right up against each other to combine it even more. I leaned tot he 6' gap as this would allow two players to be inside the table at once, where only a 4' game would mean really only one person inside it at a time. As for 2) while it was a large battle front I worked with the two adjacent players and had four throwing templates at me... that's no different than breaking the tables up a little bit and giving some room to maneuver and have that same number of players. The echelon makes it a little easier to reach the middle and everyone is faced with a 'more vulnerable flank' not just the 3 players on the corners. Even there if the corner wraps at the end where a player's one flank is more protected by his ally right or left then wrapping will mean not being hit on three sides... just two which is more workable and fun. Check this out, especially you guys who have been doing the diagrams and thinking of some solutions! The event planner... saw that this am. Too bad it is in Canada, coordinating space etc would be fun but it is a long long way and international phone calls would blow up my bill. Unless we move it to Buffalo, in which case I would be in.